One of the benefits of my previous work is I get to travel for free around MIMAROPA (Mindoro, Marinduque, Romblon, Palawan) as part of my job. A chance to travel to Culion materialized this month. We were to conduct a semestral performance review of one of our agency coverages and its attached hospitals, Ospital ng Palawan (ONP) and Culion Sanitarium (CS). 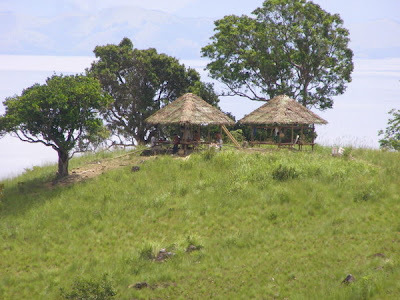 When one hears Culion, he is immediately reminded of a colony of lepers thrown in a faraway and isolated island. Culion today, however, has changed a lot since the Sanitarium there was established over a hundred years ago. The travel to Culion is not a simple one. You have to travel by air, land and sea. First, we took a Cebu Pacific propeller plane at the NAIA Terminal 3 bound for Busuanga, the airport that services the entire northern Palawan. 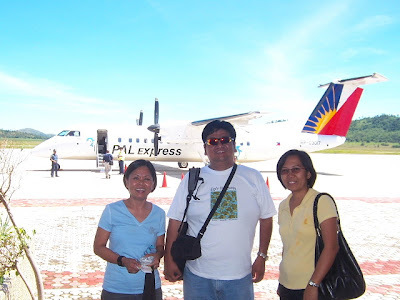 After about an hour flight, we landed at the Busuanga Airport, we had about a 1 hour land trip to the town of Coron, where from there we caught a boat going to Culion. But before we reached Culion, we had a detour to a private island, purpotedly owned by a local government official. There we had our late lunch and took a dip in the cool and clear waters around the island. Unfortunately, one of the staff from our client agency stepped on a sea urchin, which really caused him so much pain. They poured vinegar on the wounds. From then on, we became cautious on what we stepped on. The water was so calm and clear, although not sandy, that it was so hard to stay off it as its rarely that we get to swim in waters like this. After a few hours stay on the island, we continued with our journey to Culion. We passed by a pearl farm, the products is reputedly for export and not for local consumption. Apparently, the clean waters around Culion is conducive to pearl farming. As we approached the port of Culion, you can see a big eagle drawn on the wall of the mountain, with a PHS under the bird. I think it stands for Public Health Service. We were booked at the Tabing Dagat Lodge, which is about midway between the port and the Culion Sanitarium. The accommodations were very basic, with a television found in the common dining area. They have a back-up generator which was used only when there are lots of guests. A convenience store is located at the ground floor of the lodge. We had to finish our work on our first day so that we will have a chance to see the island on the next day. And that's what we did, we worked till late in the evening just to accomplish what we were supposed to do in the first place. The following morning, I woke up early and txted my officemates that I will go ahead to the CS on foot. Since it was still too early, I decided to make a detour first to the church near the hospital, the roof of which is visible as one approaches the town from the sea. After taking some photos of the church and its surroundings, I went to the CS where I waited for my companions to have our breakfast. After having our tummies filled, we were fetched by a staff from the hospital to take us around the island. First on our itinerary was a lookout point in Pulang Lupa, which gave us an almost 360 degree view of the island. They claim that it is the Tagaytay of Culion because of the vista it provided. Cottages/Huts are still in the process of construction, while some had already been built. We went back to the Sanitarium for lunch and in preparation for our afternoon swimming. After lunch, we went back to the inn to have some siesta and later on we went to find a place to swim. We had to walk about 15 minutes from the road to finally reach a small watering hole where we took a dip. 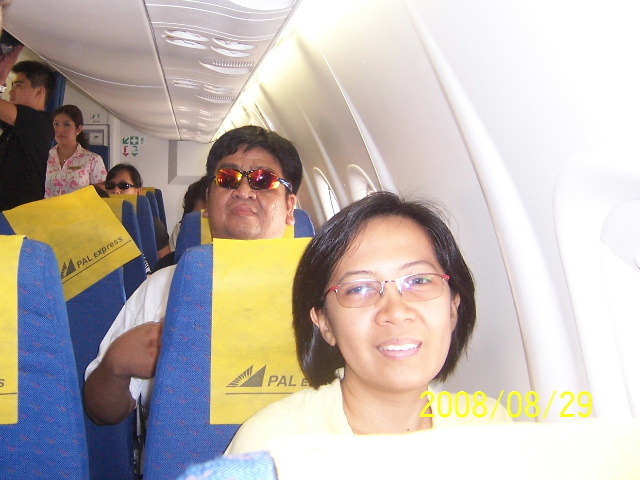 We called it a day after having our dinner and went to bed early for our early trip back to Coron the following day. As always, I got up earlier than my colleagues to take some photos of the sunrise from where we stayed. The trip back to Coron was pretty eventful. 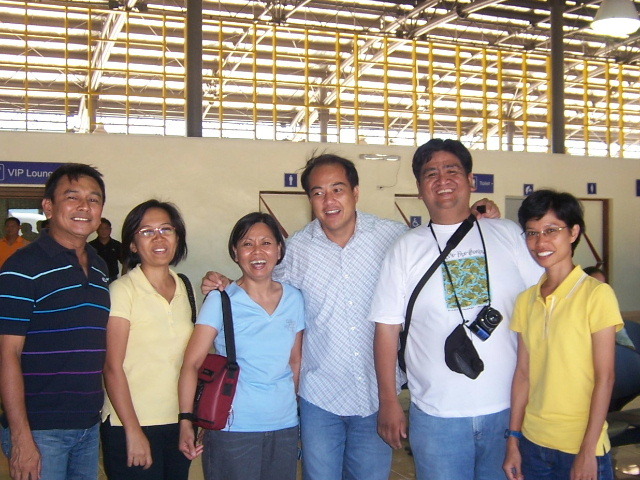 We, however, got to meet Congressman Alvarez and Mayor Reyes of Coron at the Busuanga Airport. 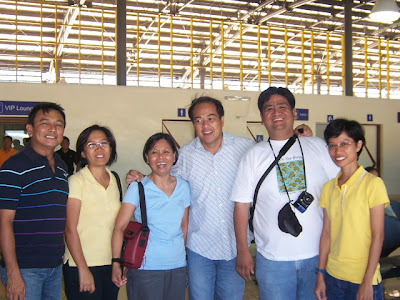 Apparently, we were on the same flight as Congressman Alvarez, while the Mayor was there to see the Congressman off. Let's go back!Can't get enough of this beautiful Island.